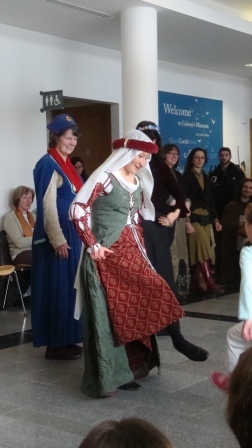 A long weekend of entertainment abounded as part of the Galway Early Music Festival. It is an annual event with a current theme of ‘Social Harmony – When Tradition and High Art Meet’. 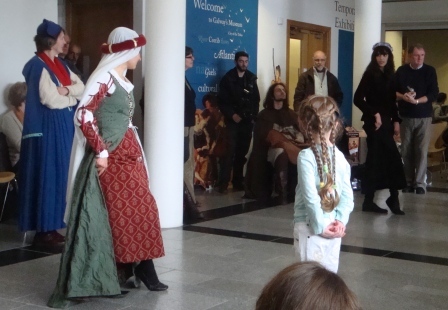 For the first part of my entry, I’ll cover the free events held at the Galway City Museum. 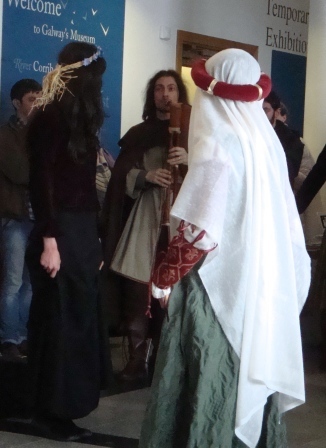 First up was Renaissance Music and Dance with performers dressed in medieval costume. 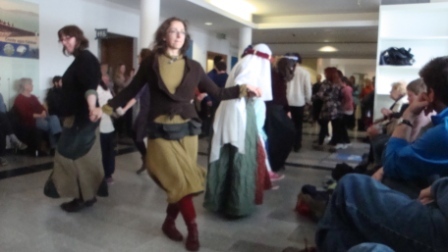 A number of simple steps were demonstrated by Lise Carrel then combined to form the dances. Several were performed in parallel lines, one in a circle, and another in a snaking line. 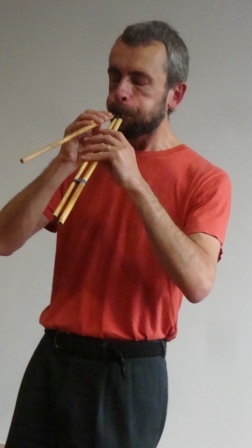 Music was supplied by Jacopo Bisagni, a renowned Italian piper and professor at NUIG. There was no shortage of willing participants from children to adults. 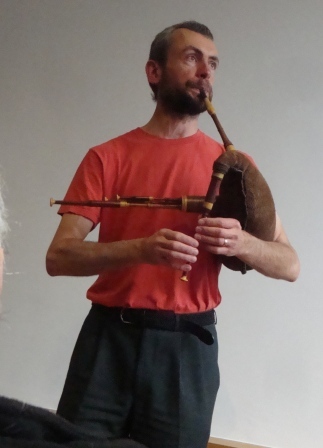 The next event, Historical Music of Scotland by Barnaby Brown, was particularly interesting. It didn’t take him long to get the capacity crowd singing along as he demonstrated some of the earliest documented techniques. While Scotland, Wales and Ireland tend to have many parallel artistic trends, Scotland has some of the oldest documented works, whereas Ireland remained largely an oral tradition (or the written works were at some point destroyed). He talked about the techniques and formats the musicians were expected to learn as well as the adjudication process they endured to earn their equivalent of bachelor, master, and PhD level certifications of the time. 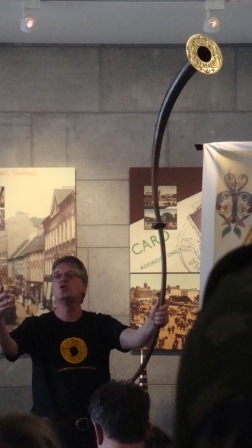 After our singing attempts, he discussed the triple pipe, a possible pre-cursor to the bagpipe, well documented in the Mediterranean island of Sardinia up to 2500 years ago. It was also known to the Celts at some point towards the eighth century, as images of the instrument are carved into high crosses and grave stones. 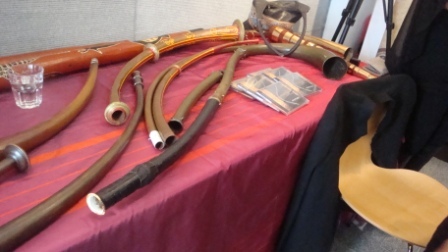 Three cane pipes are played by mouth; the longest is the drone with two chanters. There is no air bag to keep the sound going, so musicians must employ circular breathing, filling your lungs through your nose while keeping air flowing from a reserve in your cheeks – not a simple feat. He also played a few tunes on a small bagpipe. 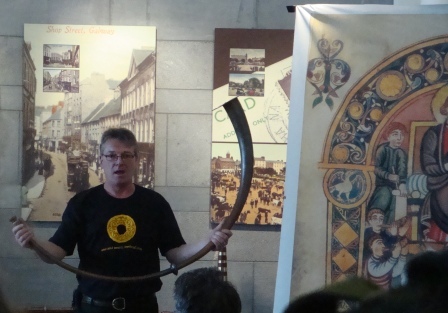 The last presentation was Prehistoric Music Ireland. 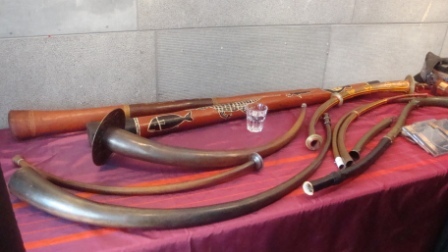 (Web site of presenter Simon O’Dwyer ) It began with an interesting demonstration of the Bronze Age Australian Aboriginal Didgeridoo and its comparison to the Bronze Age Irish Horn. The Irish version generally has up to a semi-circular curve and can be in more of an “S” shape, has a very similar sound to the Australian version. Since both countries are more than a few miles apart, this is an interesting comparison for instruments crafted thousands of years ago. Next came Iron Age examples, similar in style and sound though the ‘C-curve’ of one of the horns could be turned with a simple twist into an ‘S’ shape. 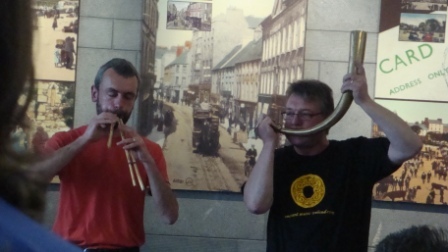 It could be played like the Bronze Age horn but also with more of a trumpet sound. There was a wide selection of horns including a much smaller bronze version that is blown from the side. It’s amazing to note that a trumpas from the Iron Age was comprised of several tubes connected by over 1,000 rivets. We may have come a long way down the technology road, but what craftspeople were able to accomplish over 2,000 years ago without modern tools is simply spectacular. Based on the attendance at these events, the festival may be looking for a larger venue next year!